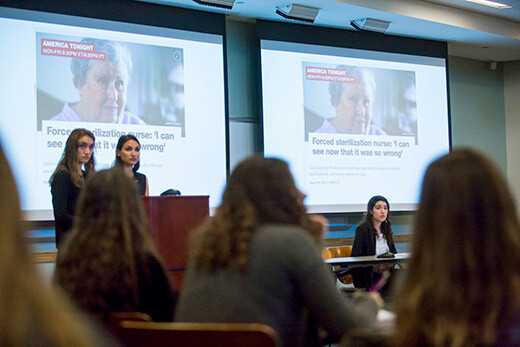 Instead of a typical final paper, students taking the religion course ‘Nazi Medicine on Trial’ held a tribunal on whether forced sterilization is immoral, judged by experts from Emory’s Center for Ethics and Office of the General Counsel. There are some questions about which we are so sure of the answer that anything that makes us question that certainty is both surprising and revelatory. This is what Jonathan Crane, associate professor of medicine and religion, wanted to happen when he challenged the students in his course “Nazi Medicine on Trial” to confront, and even defend, ideas that society has come to accept as abhorrent. Taught for the first time this semester, the innovative, interdisciplinary course investigated the medical and experimental practices of Nazis before and during WWII, as well as the Nuremberg Medical Trial of 1946-1947. Instead of concluding the class with a typical final research project, Crane tasked his students — a mix of undergraduates from a variety of years and majors — with putting an experiment on trial. “Specifically, they addressed the question ‘Is forced sterilization immoral?’ Not only were the students disturbed to learn the myriad ways Nazis sterilized people against their will and knowledge, they were astounded to learn that similar practices were done here in the United States under legal protection,” says Crane, referring to U.S. eugenics practices — including compulsory sterilization laws adopted by over 30 states that led to more than 60,000 sterilizations of disabled and ‘feebleminded’ individuals — undertaken from the first decades of the 20th century until the 1970s. Crane, the Raymond F. Schinazi Scholar in Bioethics and Jewish Thought at Emory’s Center for Ethics (CFE) and a rabbi, developed the class in response to a request for proposals from the Tam Institute for Jewish Studies for courses and projects that examined anti-Semitism and the Holocaust, a broad subject that was a natural fit considering his expertise in bioethics, Jewish studies and medicine. “In my preliminary research, I discovered quite a bit in that trial that merited further investigation and I put forward a proposal to teach a course looking at Nazi medicine and this trial in particular,” Crane says. After examining Nazi medical experimentation, the Nuremberg trials and a history of eugenics practices in the United States, students were split into two groups — defense and prosecution — to prepare for a three-day tribunal arguing whether forced sterilization is immoral. “The student teams developed opening statements; compiled evidence; gathered expert witnesses, victims and practitioners; anticipated cross-examination questions; outlined rebuttals; and composed compelling concluding arguments based on primary resources and secondary scholarship researched with the assistance of Emory librarians,” Crane says. Crane also assembled a panel of Emory experts to serve as judges for the tribunal, led by Emory General Counsel Stephen Sencer and joined by Edward Queen, director of undergraduate education at the CFE; Katie Lewis, Emory’s associate general counsel; Timothy Jackson, professor of Christian ethics; April Dworetz, professor of pediatrics; and CFE director Paul Root Wolpe. Encouraged by Crane to take the trial as a formal and serious proceeding, rather than a hypothetical enactment, students threw themselves into preparation and the atmosphere during the trial was convincingly more one of a courtroom than a classroom. Students outfitted in lawyerly attire made compelling arguments, presented expert testimony and deftly cross-examined witnesses over the three days of the tribunal. Emily Fan, a sophomore pursuing a double major in anthropology and human biology and in history focusing on law, economics and human rights, presented the opening statement for the prosecution on the first day of the tribunal. Despite defending what many would characterize as indefensible, senior political science major Jacqueline Hayes gave impassioned closing arguments for the defense at the tribunal’s conclusion. “It is important to remember what it is we are discussing. We are not looking at specific sterilization procedures, we are not discussing specific events. We are discussing the morality of the entire concept of forced sterilization. Today, the defense has shown you the act of forced sterilization can be considered moral,” Hayes argued. Although the ultimate decision of the judges’ panel found forced sterilization immoral, the judges were impressed by the “deep, powerful arguments” made by both the defense and prosecution. Sencer told the students when rendering the panel’s judgment that he came into the experience confident in his belief that forced sterilization is immoral, but his views were impacted by the students’ arguments. “Lawyers have to defend unpopular causes. I commend you for admirably defending a repugnant issue,” he told the students. Afterward, Sencer was enthusiastic about the benefit of the exercise. “I knew the question going in, but was unprepared for the commitment, engagement and excitement that the students displayed. To use a legal term, I was blown away. The students had a deep command of the material, and were also effective at arguing what evidence should be relied upon and what shouldn’t,” he says.